Denning Drive in Winter Park is going on a diet. This month, the Winter Park Community Redevelopment Agency approved $500,000 in funding for a project to turn the four-lane Denning Drive, between Webster and Fairbanks avenues, into a road with two lanes. 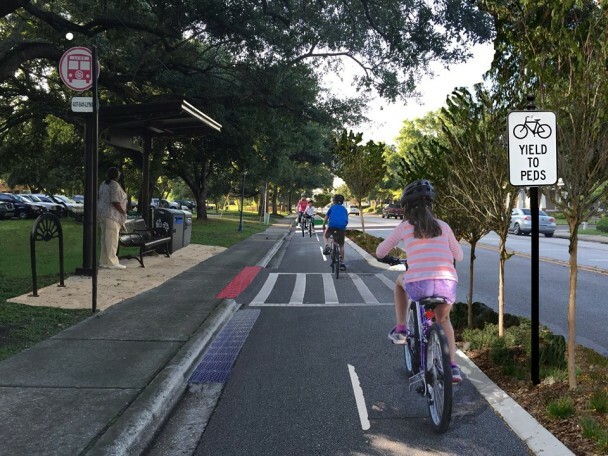 The OK from city officials is a big win for Bike/Walk Central Florida (BWCF), who, alongside BWCF Board Members Lisa Portelli, Rick Geller, Jamie Krzeminski and Eliza Harris advocated for the pedestrian- and bike-friendly plan. So what will Denning Drive look like? Aside from the four-to-two lane change, there would either be a center turning lane or a median with separated left turn lanes. And, best yet, is a designated bike and pedestrian pathway that would run down the side of the street, with a pedestrian walkway on the other side.